This past weekend, my family held our annual Halloween party. It’s been a yearly event since I was in college and every year the costumes, food and party games get more and more elaborate. Just the way I like it. One year, about 7 years ago, the entire family dressed up as characters from Star Wars. That year was legendary. There were only two grandkids at the time (there are now 9) and even they got in on the action. A one year old Yoda is a funny thing, let me tell you. We don’t do a costume theme every year, but occasionally branches of the family will go as coordinating characters. One year, my little branch went as Super Mario Brother’s characters and another year, Yo Gabba Gabba characters. A two year old DJ Lance is also hilarious. This year was yet again a great party complete with Halloween themed cocktails, cheese ball grave yards, and fried apple fritters. I couldn’t help but think back on previous years’ menus and remember what we had made in the past. 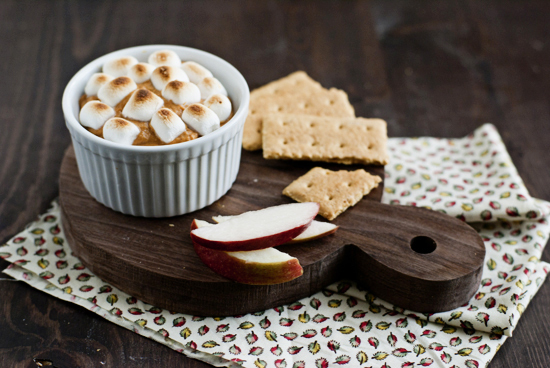 Several years ago, my sister made this baked, marshmallow-y topped pumpkin pie dip. I couldn’t exactly keep my hands off the stuff. 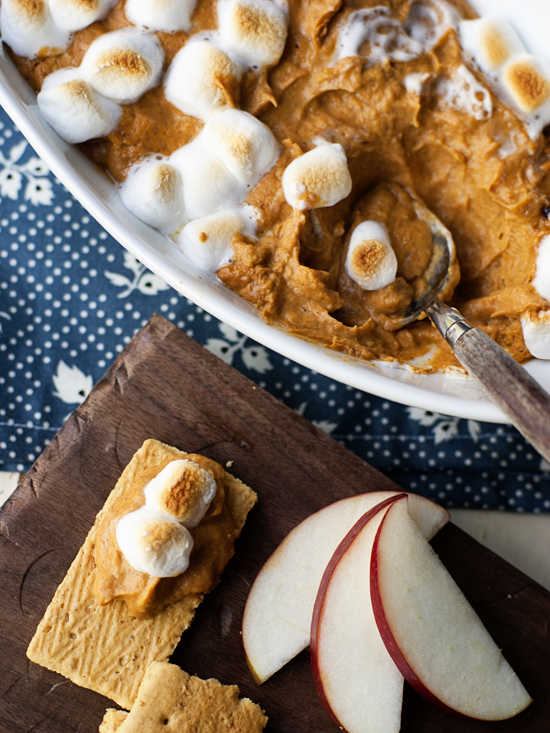 She served it with graham crackers and apple slices and let me tell you, it was like pumpkin pie and sweet potato casserole (you know, because of the mallows) teamed up to create this wonder dip. After taking note at how much I embarrassed myself with it enjoyed it, she gave me the recipe. Bless her heart. 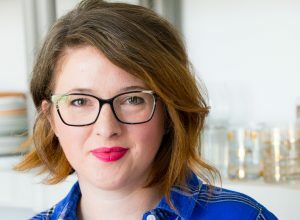 She had gotten the recipe from a Pampered Chef pamphlet many years ago, and despite a lot of looking, I was not able to find the recipe on their website to link back to. I made this dip for the Baby’s birthday party a couple of weeks ago but it goes equally well with a Halloween, Thanksgiving or even football themed get together. Speaking of Thanksgiving, you should have seen my kitchen this weekend. It was as if Thanksgiving exploded a month early – all in preparation for my new “Ultimate Thanksgiving” series. Stay tuned in the coming weeks for my top Turkey day recipes. Trust me, you’ll want to see them. 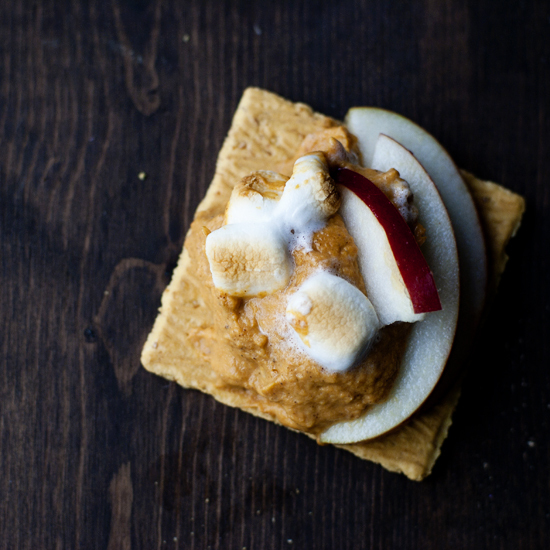 In a bowl of an electric mixer, beat cream cheese with paddleattachment until soft and creamy. Add pumpkin, brown sugar, pecans (if using), pumpkinpie spice and cinnamon; mix on medium speed until incorporated. Spoon the mixture into a 2 cup baking or gratin dish. Topwith mini marshmallows and bake in the oven 12-15 minutes. 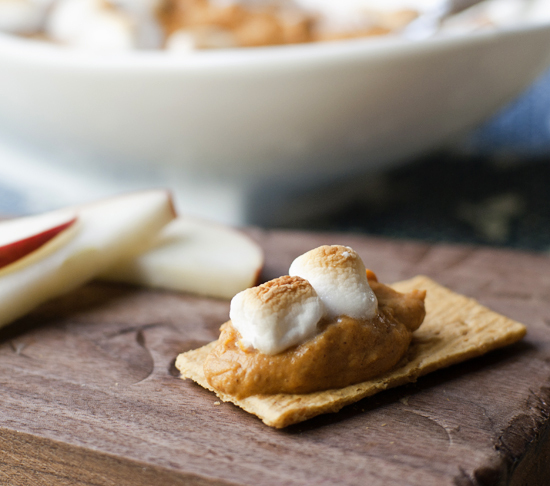 Serve the dip warmwith apple slices and graham crackers. The dip can be mixed ahead of time (without topping withmarshmallows) and stored in the refrigerator until ready to bake. Simply takethe dip out of the fridge, top with marshmallows, pop it in the oven and increase baking time by about5-7 minutes. Just watch the marshmallows to make sure they don’t burn. This is a great idea! I love the flavour of pumpkin pie, but don’t necessarily want the richness (or the work) of the crust. 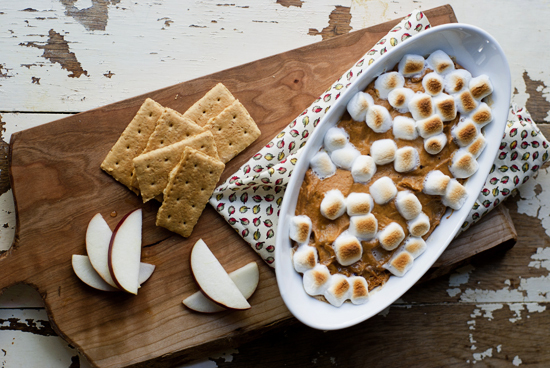 I bet this dip would be great with ginger snaps too! Thanks for the recipe, have pinned to try! You’re right, Katie, I bet that would be awesome! I’ll definitely try that next time. Thanks for stopping by!